While the second view – taken on 10 April 2011, at Dunsfold – shows the fleetname. I have always admired this style of Burlingham saloon body, and it is good to see this vehicle in such fine fettle. I recall seeing it around quite often in Guildford on my visits to the town in the 1950s and 1960s. 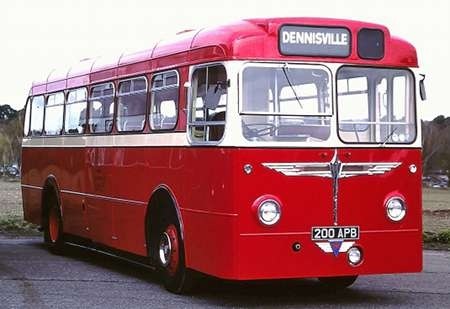 Safeguard sold this bus surprisingly early in its life in 1962 to the South Petherton, Somerset firm of Safeway, similarly named and similarly liveried, where it stayed until 1982. It then passed into the hands of a preservation group and spent a period with the Quantock heritage fleet, Taunton, before returning to Safeguard ownership. OBP has an item on a Safeway coach submitted by Ken Jones, together with an informative link that includes pictures of this Reliance; see Safeway Coaches – Dennis Lancet – ASV 900. Five weeks ago, I went to Ottershaw, Surrey, for a one hour meeting. At the end, I had a nose bleed, heamorrhage-style! I spent five days in Guildford Royal Hospital and watched Safeguard buses passing by every 15 mins. Seeing this activity and looking at their website, it was a great surprise that this long-lasting firm is still around and even blooming, it would seem. My memories of them date from the early 1960’s, when I worked by Guildford rail station. There is a photo of 200 APB on their website, decked out with wedding ribbon. 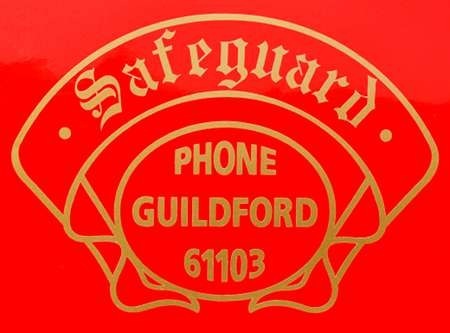 Safeguard had a reputation for keeping vehicles for a relatively short time, always having a modern fleet, certainly when I knew them in the seventies and eighties.A well run and highly regarded company, still with a decent livery today. Sorry to learn of your recent stay in hospital, Chris H. My father had three or four similar instances (involving Southampton General) Take care, young Sir! Oh dear Chris, sorry to hear that Ottershaw had such a bad effect on you. It doesn’t happen to everyone though, i’ve lived there for 30 years without any problems! Also surprised that you went to the Royal Surrey, given that St Peter’s Hospital is so close. Thx Pete/Grahame for your commiserations! St. Peter’s put a bung up my nose to stop the bleeding, but the Royal had an ENT Dept to cauterise etc. I’ve been visiting Ottershaw since the 1950’s and the journey from Portsmouth, by train, was always worthwhile for a ride on the A & D Dennis Lance K3’s with their ‘Supertop’ 5-speed gearboxes, which enabled them to fairly scoot along from Woking to Botley’s Park! Thankfully, one’s been preserved.